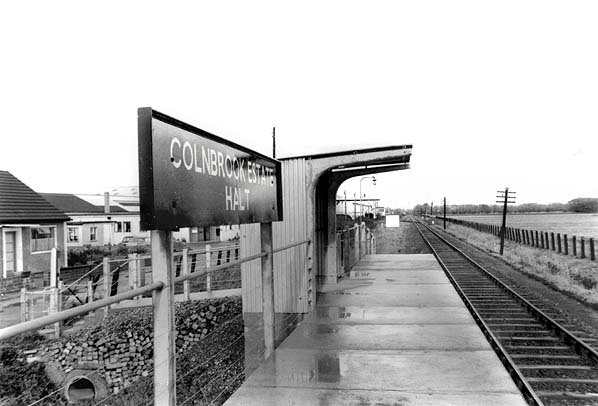 Notes: Colnbrook Estate Halt opened on 1 May 1961 to serve the adjacent industrial estate. The facilities were very basic consisting of a short pre-cast concrete platform and a shelter. A single hand-painted sign and at least one totem name sign was provided. No trains were scheduled to stop at the halt. Any passengers wanting to alight at the halt had to inform the guard at West Drayton or Staines West. Passengers wanting to join a train had to give ‘the necessary hand signal’ to the driver as the train approached. The halt is shown on some tickets as Colnbrook Estates Halt although this was never an official name. The halt lasted less than four years, closing with the line on 29 March 1965. It was still standing in 1968 but had been demolished by the early 1970s. The early history of the Staines & West Drayton Railway is complicated and is a familiar story involving a campaign from local interests to improve railway connections by trading on the rivalry between two main line companies. brewery, mustard mills, a papier-mâché factory and the world’s first linoleum works, producing the floor covering invented in the town in 1860-63 by Frederick Walton. With the GWR main line only six miles to the north across ‘easy railway country’, the business interests in the town, hoping to lower freight rates and open up new outlets, were turning their attention to a route first used by three unsuccessful Uxbridge & Staines Bills of the 1840s. After the failure of a Bill deposited in 1863 for a West Drayton & Staines Railway, one of two similar schemes deposited in November 1865 became the Colnbrook Railway Act of 1866, comprising a single standard gauge line running south from the south side of the GWR station at West Drayton to the LSWR Windsor branch at Staines Moor. The proposals included a line passing below the GWR at West Drayton to allow through running between Uxbridge and Staines. On 13 July 1866 the GWR agreed to work the line for half the gross receipts, but the powers to build it expired before the £60,000 capital could be raised. A second Act of 7 July 1873, authorised the 5m 2f 9·2ch Staines & West Drayton Railway over the same route, joining the LSWR 43ch north-west of the bridge over Staines High Street, but omitting the through link to the Uxbridge branch at West Drayton. This time the LSWR reacted with some vigour to the invasion of its territory, opposing the Bill by alleging that the proposed junction at Staines would be dangerous and the extra traffic impossible to accommodate at the existing Staines station, which had not been built as a terminus. These objections produced a clause in the Act which required that the line be built only to standard gauge, which would restrict any expansionist tendencies on the part of a still largely broad gauge GWR. The Staines & West Drayton Railway Company formed by the 1873 Act suffered a long period of negotiations and frustrations before the line was built. These delays required time extensions in 1878 and 1881 when an alteration to the GWR junction was approved. This took the new line under the GWR to join the Uxbridge line before running in to the north side of West Drayton station. During this period, the local company even approached the LNWR suggesting that the new line could form part of a new route around the west side of London, which would bring LNWR trains from Watford via the proposed Uxbridge & Rickmansworth Railway, the GWR branch to Uxbridge and new line south of Staines, and on to the SER and LBSCR via Leatherhead and Dorking. This move did nothing to improve relationships with the LSWR, driving the S&WDR deeper into the clutches of the still somewhat reluctant GWR. An agreement was at last signed on 13 November 1882, which confirmed that the GWR would work and maintain it after the first six months in return for half the gross receipts. Not wanting to antagonise the LSWR further by pursuing the original proposal of a joint station, the GWR insisted on an independent terminus to handle both passenger and freight traffic. A new Bill was immediately put before Parliament to authorise this new station and a link with the LSWR north of the terminus. In late 1881, the engineer A. Thuey agreed to construct the line for £89,000, and in March 1882, 7,500 shares of £10 each were made available to prospective investors. There was seemingly little interest however, as after two months only 314 of these had been sold, so the railway’s future was once again in question even though construction had already started. There was still trouble ahead for the fledgling company and a lack of progress resulted in Thuey’s dismissal and a replacement builder being sought. On 9 June 1882 the contract was awarded to Messrs Lucas and Ansdell, and a new prospectus was issued. On hearing the news Thuey, who was still smarting from the company’s earlier action, made his feelings public and sued his former employers for damages. Protracted legal action was a drain on finances culminating in the appointment of a receiver. At this time the GWR came to the rescue with additional capital. Messrs Lucas and Ansdell soon fell from favour and they also decided to take legal action for breach of contract. By this time the only money left was that advanced by the GWR, so the company was clearly in no position to take on a legal battle. As it was, the court had come down on the side of Thuey and granted him damages of £16,000 plus costs, a ruling described by the S & WDR chairman as ‘most extraordinary and outrageous’. Lucas and Ansdell also won their case, so there was only one course of action. The company re-employed Thuey as engineer for the Colnbrook to Staines section, whilst construction work would be handled by Lucas and Ansdell. allow the GWR to start six passenger trains a day on weekdays from Saturday 9 August 1884. Further progress southward was delayed by the continuing financial crisis, exacerbated by the withdrawal of labour when wages could not be paid. In an attempt to cut costs Thuey, saved £1,15O by adapting a house owned by Charles Waring Finch (of Finch & Rickman’s Mustard Mills) as the Staines terminus. was suitable for public use, and services commenced seven days later, opening for passenger traffic on 2 November 1885 when it was served by nine trains each way to and from West Drayton on weekdays. At first passenger receipts were poor as few people wished to cross this somewhat sparsely populated stretch of outer London. Apart from a little commercial and professional traffic between Uxbridge and Staines, or passengers seeking destinations on the GWR west of London, the trains were all but empty. The line took only £217 13s 7d during its first two months of operation as a complete branch. Freight traffic was also slow to develop despite the provision of yards at Colnbrook and Staines, but this gradually increased. In May 1887 a line was built across the river into the works of the now-prosperous Staines Linoleum Company, yet even this had to be shared with the LSWR, who were also invited into the factory. Initially Colnbrook was the only intermediate station but, after closure of the ranges on Wimbledon Common, a Metropolitan Rifle Range Company was formed in 1890 to build new ranges near London for those Volunteers who were reluctant to travel to Bisley. One of the directors of the new rifle range company was also a director of the S & WDR, so perhaps it was no surprise that the chosen site for the new range was at Staines Moor, just west of the new line. The GWR agreed to provide a halt called Runemede, which opened with the ranges on 1 March 1892. By then, possessing over 85% of the S & WDR issued stock of £161,640, the GWR acquired powers in its 1900 Act to take over and dissolve the company, which took effect from 1 July that year. At this time there were still only about eight trains daily to and from West Drayton, where they shared the north side island platform with the Uxbridge trains. One of the down workings ran mixed traffic, restricted to six vehicles, a feature which lasted until the 1930s. A Sunday service started in 1887 with four trains each way. Once the GWR assumed full control there were some improvements, so that by 1912 there were 14 workings each way, a few operating to and from Paddington and Aldgate; between 1904 and 1911 there were even through runs between Staines and Victoria. One-class steam auto-trains, introduced on Sundays from 1 October 1914, were later extended to weekdays, so that by 1 January 1916 all but one train was of this type. In October 1921 there were 16 journeys each way daily, with departures from West Drayton between 7.23am and 10.28pm; on Sundays there were seven each way between 10.12am and 9.52pm. Use of the Staines Linoleum Factory for military purposes and opening of camps around Staines provided new traffic during WW1, but afterwards the more relaxed tempo of what was essentially a ‘country branch’ was quickly resumed. Freight remained more important than passengers, not that the latter were neglected. At the time when the GWR was trying to extract the last ounce of business from its investment in branch lines by opening many new halts, the Staines line was not overlooked. On 11 July 1927, Stanwell Moor & Poyle Halt (renamed Poyle for Stanwell Moor on 26 September 1927) was opened 65ch south of Colnbrook to serve the explosives works, Stanwell Moor village and scattered farmhouses west of the line. The service on weekdays remained at about the same level through the 1920s and 1930s, but rush-hour workings of five coaches, generally hauled by 2-6-2T, ran to and from Paddington, missing the branch halts. Sunday services were built up to 14 each way between 9.02am and 9.58pm from West Drayton. War again brought change when the authorities decided that the line had some strategic potential, seeing a role in bringing traffic from the North and Midlands safely round into Feltham Yard or other points in south and south-east England, should the London river crossings be severed by enemy action. To achieve this a curve, closely following the 1873 Act alignment, was built from a point south of Yeoveney (formerly Runemede Range) Halt to the Southern Railway's Windsor branch at Staines Moor Junction, north-west of the GWR terminus. At West Drayton, double-track was installed from the junction with the Uxbridge branch to the bridge under the main line. All was ready in June 1940, but no use was made of the new link until 15 September that year after the Metropolitan Extension at Snow Hill (Holborn Viaduct) had been blocked by bomb damage. Thereafter, for a few years train crews occasionally found their goods trains routed this way to and from the GWR at Greenford, but this ceased with the end of the war. There was a suggestion that the GWR terminus should be closed, diverting trains from West Drayton into the SR station over the wartime link. The Southern resisted, stating that this would require improvements to be made at their station. The proposal was dropped, and the junction at Staines Moor was taken out on 16 December 1947. With the coming of nationalisation, the infant British Railways found itself with two stations called Staines, so from 26 September 1949 that on the Southern was renamed Staines Central, whilst the Western branch terminus became Staines West. Long awaited development finally arrived at this west London backwater in 1946 with the opening of London Airport (Heathrow) and shortly afterwards industrial estates began to appear alongside the branch between Poyle and Colnbrook. To serve one of these new estates, Poyle Estate Halt, with a 50ft platform and tiny concrete shelter, was opened on 4 January 1954, about half-way between Poyle and Colnbrook. Trains stopped at rush hours, but at other times by request only. On the same day, two extra journeys were provided, making 18 each way daily and 12 on Sundays. Steam remained supreme on this untypical London line, where most trains were push-pull units of two saloons (some former GWR railmotors) powered by 14XX 0-4-2T. Freight was usually handled by 57XX 0-6-0PT and 61XX 2-6-2T. South of the factory estate belt, the line retained much of its rural character through the 1950s, although its peace was increasingly shattered by aircraft noise. Yeoveney, a miraculous survival from a gentler, romantic era, was now frequented only by occasional fishermen. The halt was eventually closed ‘due to the cost of repair’ after the last trains had called on 13 May 1962. Other more important changes were made in these post-war years. Freight movements south of Colnbrook ceased on 30 October 1953 when all such traffic was transferred to Staines SR yard. By some bureaucratic oversight, the signal box at Staines West was left open although there was never more than one train on the line at a time south of Colnbrook and the engine shed had closed in June 1952.
on Sundays there were now 16 trips to and from Staines West with a last departure from West Drayton at 10.43pm. Except for the first three weekday trains in the morning and two in the evening which called at Poyle Estate and Yeoveney halts, notice to the guard at West Drayton or Staines West was necessary if one wished to alight at these places at other times. Yet another halt was opened on 1 May 1961 between Colnbrook and West Drayton. 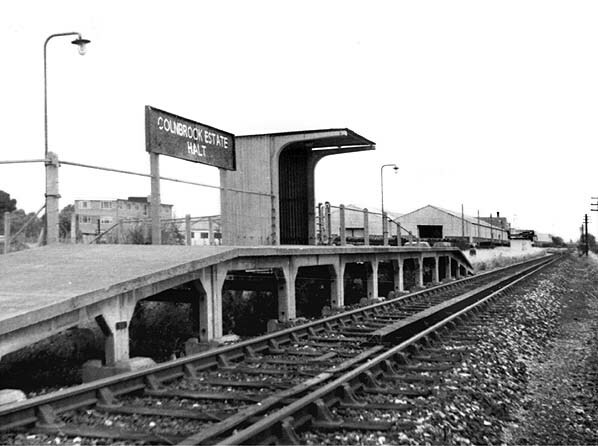 Operated as a conditional stop, Colnbrook Estate Halt had a short platform similar to that at Poyle Estate. As a result of its opening there were now four stopping places on the branch in little over a mile. Because the precise times of request stops at the halts were not always stated in the Western Region public timetable some fiendishly complex footnotes were provided instead: these challenged any intending passengers to work out for themselves when the trains called and informed them of the correct procedure for joining, or alighting from, trains. The Western Region route from Staines to central London was not ideal for commuting. The distance between the branch terminus and Paddington was 19miles 39chains, and journeys often involved a change at West Drayton. The Southern line from Staines Central however, although of similar length, offered the convenience of regular through services and the efficiency of electric traction. The only advantage of travelling from Staines West was that the trains were less crowded and it was easier to find a seat! However traffic results in 1960 were such that BR could not make a convincing case for closure when this was suggested as a means of reducing the cost of the Staines by-pass road, then under construction. Beeching’s accountants were able to show in 1962 that, by their standards, the branch was not ‘paying its way’, so passenger closure was listed in the Reshaping of British Railways report of March 1963. The formal proposal of closure was published on 6 September 1963, and the Secretary of State for Transport agreed on 10 September 1964 that passenger services should be withdrawn. Extra workings at rush hours were discontinued in October 1964, and the last passenger train ran on Saturday 27 March 1965, Sunday workings having ceased late in 1961; the formal closure date was 29 March 1965. Alternative public transport was provided by buses following a meandering route between West Drayton and Staines. Meanwhile freight underwent a minor revival. During 1964 the Staines West goods yard was demolished to make room for an oil storage depot served by a siding accommodating 12 tank wagons. From October that year freight trains were again seen south of Colnbrook, bringing oil from Purfleet to the new depot. In 1975 there were 15 trains a week carrying between 1,200 and 1,500 tons of oil. Colnbrook was in that year receiving oil trains at an average of 75 a week (6,000 to 7,500 tons) and also about 10 tons of scrap metal a week. At the same time oil was coming into Thorney Mills, between Colnbrook and West Drayton, in an average of 24 trains a week (1,000 tons); 10 trains a week of stone (3,000 tons) were also arriving. In addition this depot dispatched scrap metal at the rate of 360 tons a week. Staines West was the BR (WR) Farewell to Staines West Branch railtour on 24 January 1981. This DMU tour from Paddington did not actually reach Staines West, running instead onto the new spur to Staines Central and on to Windsor & Eton Riverside; it followed the same route on its return journey. This was the only passenger train that ran between the Staines West branch and Staines Central. Freight trains still run from West Drayton to Colnbrook, serving an aggregates depot and an aviation fuel terminal for Heathrow Airport. Following a period of public consultation in 1998, BAA submitted plans on the 24 July 2009 to the Secretary of State for Transport seeking authorisation under the Transport and Works Act to acquire the necessary land and begin constructing the Heathrow Airtrack which would incorporate a short section of the former Staines West route. This new line, as proposed by BAA, would have run from Heathrow Terminal 5 into central London and across the suburbs of south-west London. Work had been forecast to begin in 2011, with rail services operating by 2015. However in April 2011 BAA announced that it was abandoning the project due to lack of money. In October 2011 Wandsworth Council announced a revised plan called Airtrack-Lite. Between Colnbrook and Staines Moor the track has been lifted and the formation built over in several places. 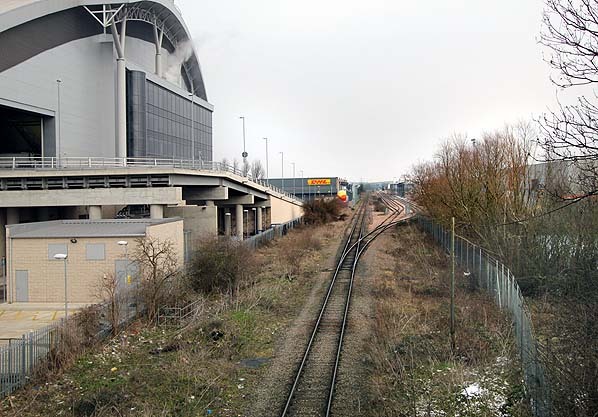 Part of the viaduct at Staines Moor is used as a footpath, and the trackbed can be walked from just north of Staines West station to a short distance beyond Yeoveney Halt, where the former formation is lost under the M25. The trackbed reappears just south of Horton Road by junction 14 on the M25 and can be walked through the site of Poyle Halt. North of Horton Road the bed is heavily overgrown as it passes along the east side of Poyle Industrial Estate. It is passable with difficulty during the winter but virtually impassable during the summer without a machete or something similar. Tickets from Chris Totty. Michael Stewart and Brian Halford, route map drawn by Alan Young, Bradshaw from Chris Totty. 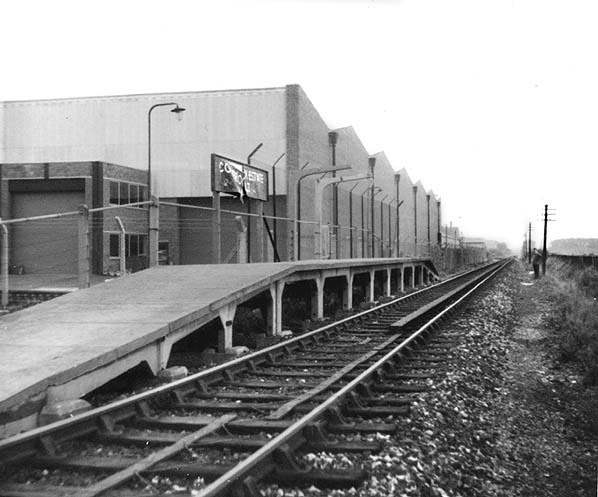 Colnbrook Estate Halt looking north in October 1961, seven months after it opened. Colnbrook Estate Halt looking north in August 1966. Colnbrook Estate Halt looking north in September 1967. Note the shelter has been removed as the expanding industrial estate has encroached on the site. 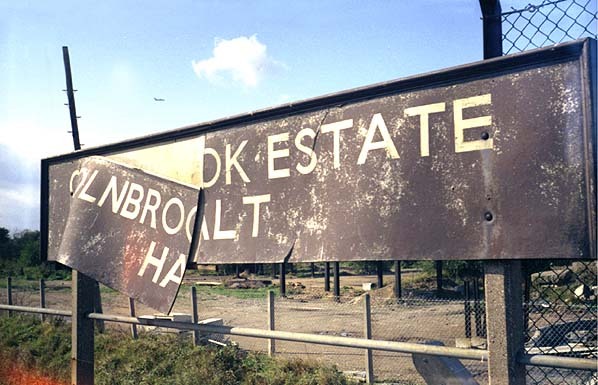 Colnbrook Estate Halt sign in May 1968. Looking north at the site of Colnbrook Estate Halt in February 2012.